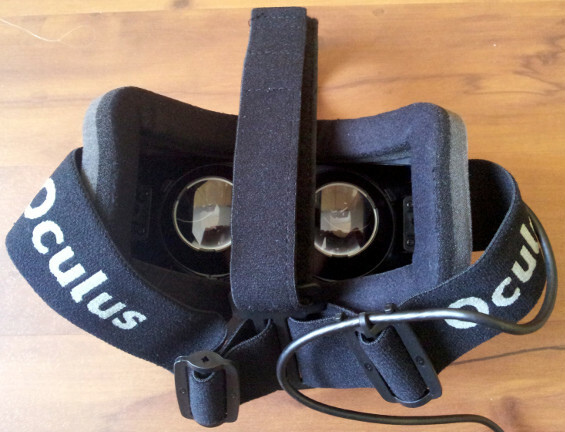 When I first opened the box, I found the Oculus Rift device, which is attached to the control box with a fixed cable connection. 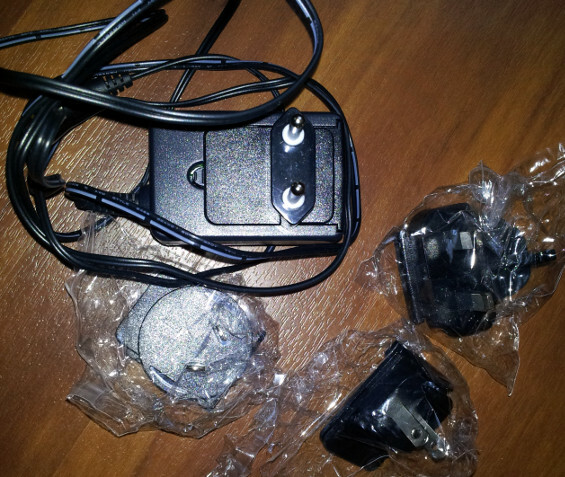 The video signals and the position from the head tracking device will be carried by that cable. 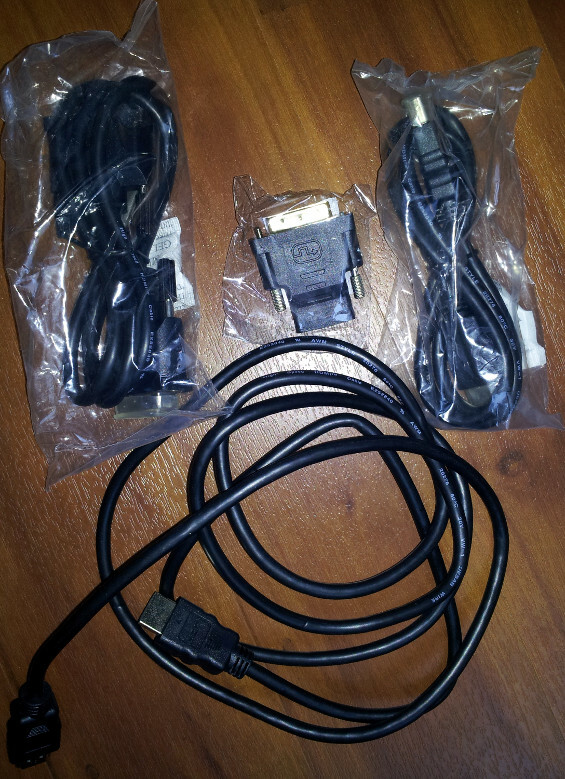 The box has connectors for mini-USB (for the connection with the computer, will carry the head tracking information), DVI, HDMI (for video signals obviously) and a power jack. On the box itself you have got controls for contrast and brightness of the display inside the Oculus Rift and a power switch. With the Oculus come 3 pairs of lenses (labeled A, B, C) which you can choose from to match your level of eyesight. I found myself comfortable using the „B“ lenses. I don’t wear glasses normally. 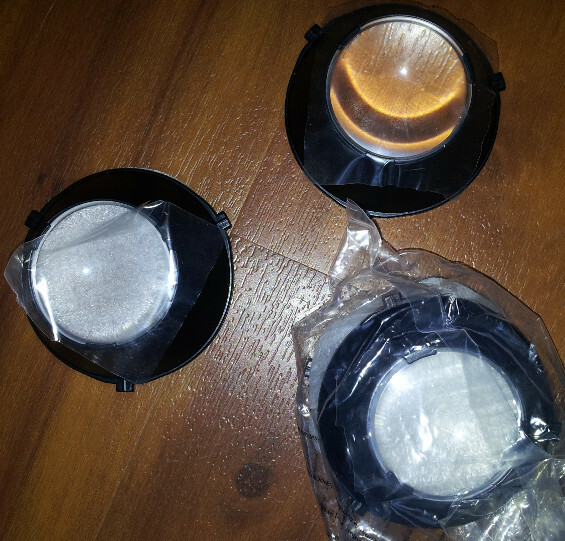 Attached where the „A“ versions of the lenses which didn’t work at all for me. Everything was waaaaay to blurry for me. 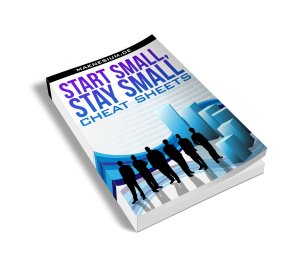 … and the manual. Nothings do do here…. 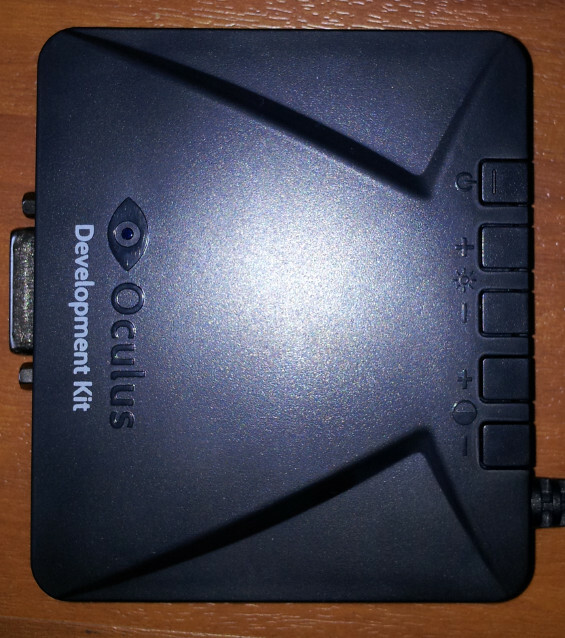 First, you have to boot up you machine (I used Windows 7 for this test) and register yourself at the Oculus development site (https://developer.oculusvr.com/) in order to obtain the latest version of the development kit. You’ll be sent an email and after that you are granted access to the oculus development community. If you download all packages (SDK, Demo) from their site you are looking at 575 MB for version 0.2.2. 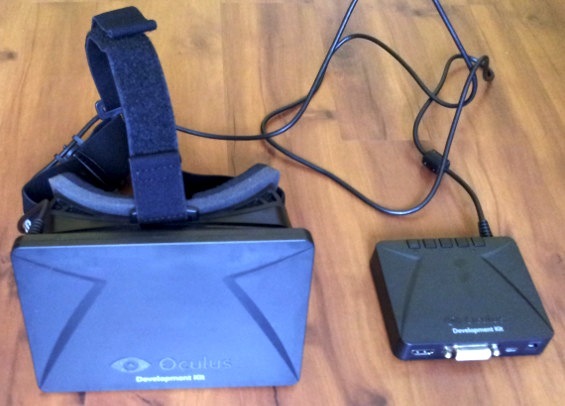 First, plug in the HDMI / DVI and the mini-USB cables into the box attached to the Oculus Rift and connect them both to your computer. Finally plug in the power jack. 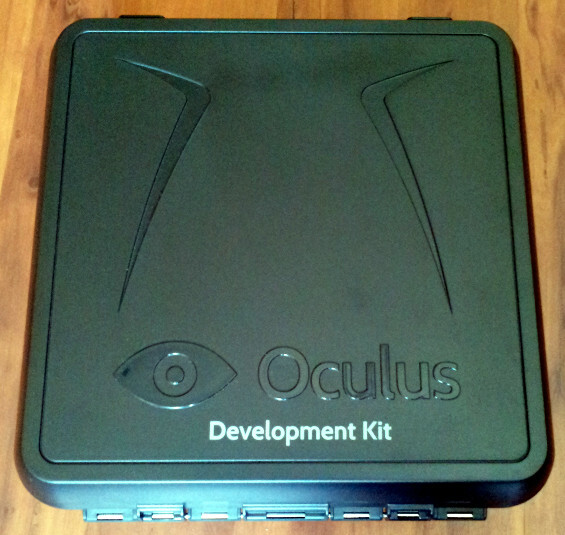 The process is described in great detail in the manual of the Oculus Rift. So look there if you need more information for setting things up correctly. When the SDK download finished, the first thing I did was turning the Oculus Rift on and settings my desktop screen to „mirrored“ mode with a resolution of 1280×800 (native resolution of the Oculus Rift). Then I put on the glasses and started the demo within the downloaded SDK named „Tuscany“ and put on the Oculus Rift…. … WOW, okay, this looks impressive. You are drawn into the scene within seconds (if you chose the right lenses for your level of eyesight, of course). The scene has very simple graphics if you compare it to modern games and when you do your first steps you recognize the most important problem of the Oculus Rift: low screen resolution! 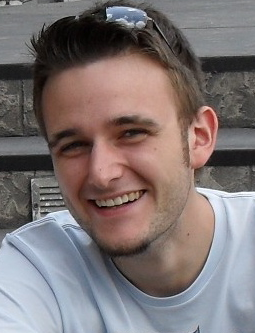 You can see the pixels right in front of you and you understand why they ship it as „Dev Kit“. The technology is amazing yet not „good looking“ enough to be given into consumers hands. Don’t get me wrong: the 3D effect is absolutely amazing but the graphics will take you back one or two decades in terms of resolution. So after walking around for some minutes in Tuscany, I figured I was now ready for real action. WOW, this „real“ 3D game, albeit being released in 2005 (which translates to“ancient“ in terms of computer graphics) really is a blast. Graphics are far better than in the Tuscany demo and you have got sound. To really immerse into the world you’ve got to wear headphones. This makes a huge difference and you really get „pulled in“. The train arrival in City 17 might make you feel a bit sick, at first. After a couple of minutes you start to feel yourself at home. In default mode, Half Life 2 lets you control your target cross with the mouse and move your field of view (your head) with the Oculus Rift device. So you can look around and have to aim the same time which really adds another dimension to the game. What I found really astounding is the level of detail in the 3D virtual reality: When examining Medi-Kits or simple stone blocks at the floor REALLY EVERY DETAIL is three dimensional. This lets you notice all the sharp edges and bevels of a Medi-Kit if you knee over it. It looks just so real. Pretty amazing! Okay, now you’ve got my opinion… What did my workmates say? They were baffled how real the immersion into the 3D worlds was. 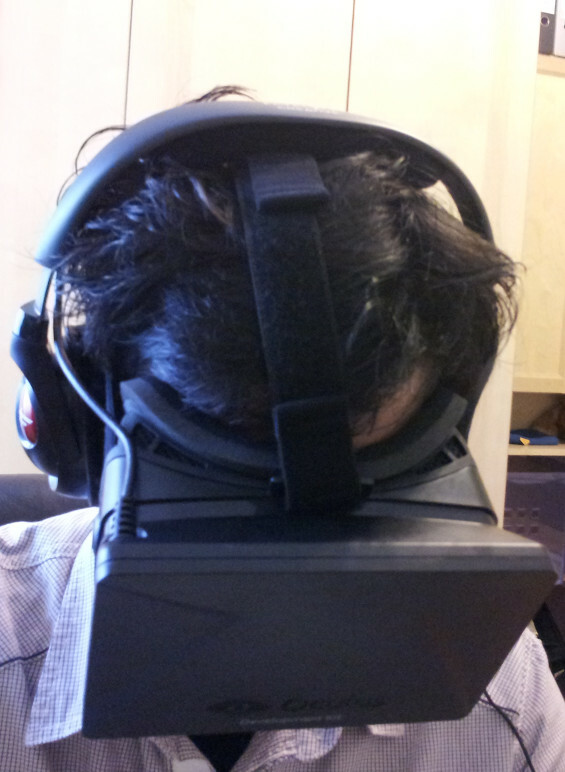 The time for getting used to Oculus VR was less than a minute for all of my colleagues. So everybody should be able to get a quick first impression in no time. You could really see them smile when they took their „first virtual steps“ into the Oculus Rift world. They told me, they would buy such a device if the resolution of the screen would be higher (as I said: in the development version you can see every pixel and even sub pixels). As for control: most preferred mouse & keyboard. I’ve seen quite some reviews on the web recommending using a game pad, though. Anyway, nearly all subjects told me that they began to feel a little „seasick“ after three or so minutes. I had this issue myself the first hour or so. But after some days your body (or your mind in particular) got used to the feeling and you start to get immune to motion sickness and can use the Oculus longer and longer. 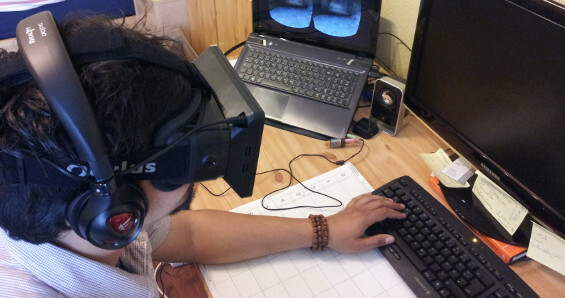 Akasha, a friend of mine had no problems using the Oculus Rift for the first time for about an hour in one go. Some people seem somehow not to get affected by the motion sickness. Even when trying the Oculus Rift for the first time. So, that’s it for now! You’ve used the device yourself and share your experiences? You would like to use it? You live in Cologne, Germany? Did I miss something? Let us all know in the comments section. Vorheriger BeitragUpgrade to Ubuntu 13.04 Raring Ringtail in less than 20 minutes without problemsNächster BeitragQuick Hint: How to remove a file from subversion version control after accidently adding it?